A balanced vegetarian or vegan diet can provide many health benefits. These diets have been associated with weight loss, better blood sugar control, a decreased risk of heart disease and a lower risk of certain types of cancer (1, 2, 3, 4). However, it can be challenging to maintain a well-rounded vegetarian diet that provides all the nutrients you need. This article uncovers some of the most common mistakes people make on a vegan or vegetarian diet, and how to avoid them. Unfortunately, just because a food product is labeled “vegetarian” or “vegan” doesn’t necessarily mean it’s healthier than the regular alternative. For example, almond milk is a popular, plant-based milk that’s often a staple in vegan diets. However, while almond milk is low in calories and enriched with several important vitamins and minerals, it is not necessarily healthier than cow’s milk. For example, 1 cup (240 ml) of low-fat cow’s milk contains 8 grams of protein, while the same amount of unsweetened almond milk contains only 1 gram (5, 6). Sweetened almond milk can also be high in added sugar, with 16 grams of sugar in just 1 cup (7). Other vegetarian products, such as soy-based veggie burgers, nuggets and meat alternatives, are often highly processed, with a long list of artificial ingredients. So they’re often no healthier than other non-vegetarian processed foods. Despite being vegetarian, these products are also often high in calories, yet lacking the protein, fiber and nutrients necessary for a balanced meal. While these products may ease your transition to a vegan or vegetarian diet, it’s best to consume them in moderation with a diet rich in nutritious, whole foods. Summary: Many foods marketed as vegetarian or vegan are often highly processed, high in added sugar or lacking in nutrients. If you include these products in your diet, eat them only in moderation. Vitamin B12 plays several important roles in the body. It’s important in the creation of red blood cells and DNA, among other processes (8). Unfortunately, the main sources of vitamin B12 are animal products, such as meat, poultry, shellfish, eggs and milk products. For this reason, vegetarians have an increased risk of vitamin B12 deficiency (9). Vitamin B12 deficiency can cause fatigue, memory problems and numbness. It can also lead to megaloblastic anemia, a condition caused by having a lower-than-normal amount of red blood cells (10). Unfortunately, a high intake of folate can actually mask vitamin B12 deficiency, hiding symptoms until the damage becomes irreversible (11). However, there are foods and supplements available that can help vegetarians meet their vitamin B12 needs. Besides animal products, fortified foods and certain types of edible algae also contain vitamin B12 (12, 13). Vegetarians should monitor their vitamin B12 intake carefully and consider taking supplements if their needs aren’t met through diet alone. Summary: Vegetarians and vegans are at a greater risk of vitamin B12 deficiency, so make sure you consume fortified foods or B12 supplements. One of the easiest ways to make nearly any dish vegetarian is to take out the meat and replace it with cheese. When it comes to flavor, the swap works well for sandwiches, salads, pasta and many other dishes. However, while cheese does contain a good amount of protein, vitamins and minerals, it doesn’t replace the wide assortment of nutrients found in meat. One ounce (28 grams) of beef, for example, contains four times the amount of iron and double the zinc found in one ounce of cheddar cheese (14, 15). Cheese also contains less protein and more calories than meat. In fact, ounce-for-ounce, cheese contains only about 80% of the protein found in chicken, but nearly 2.5 times the calories (15, 16). Instead of simply replacing meat with cheese, you should include a variety of plant foods in your diet to meet your nutrient needs. Chickpeas, quinoa, tempeh, lentils, beans and nuts are all excellent options to help round out a vegetarian diet. Summary: Instead of just replacing meat with cheese, make sure to also include a diverse range of plant foods in your diet to provide important nutrients. Many foods and food groups are off-limits for vegans and vegetarians, which can make it challenging for them to meet their calorie needs. In fact, vegans and vegetarians tend to eat fewer calories than people who eat both meat and plants. One study compared the nutritional quality of 1,475 people’s diets, including vegans, vegetarians, vegetarians who ate fish, people who ate both meat and plants and people who ate meat only once a week. Vegans had the lowest calorie intake across all the groups, consuming 600 fewer calories than people who ate both meat and plants. Vegetarians had a slightly higher calorie intake than vegans, but still consumed 263 fewer calories than people who ate both meat and plants (17). Calories are the main source of energy for the body, and your body needs a certain amount to function. Restricting calories too much can lead to several negative side effects, such as nutrient deficiencies, fatigue and a slower metabolism (18, 19, 20). Summary: Vegans and vegetarians tend to have a lower calorie intake than people who eat meat and plants. If you’re following either of these diets, make sure you’re meeting your calorie needs. Drinking enough water is important for everyone, but may be especially important for those who eat a lot of fiber, including vegetarians and vegans. Vegetarians tend to have a higher fiber intake, since fiber-rich legumes, vegetables and whole grains are staples in a healthy vegetarian diet. One study found that people who eat both meat and plants eat about 27 grams of fiber per day, while vegans and vegetarians eat about 41 grams and 34 grams, respectively (17). Drinking water with fiber is important because it can help fiber move through the digestive tract and prevent issues like gas, bloating and constipation. Fiber consumption is incredibly important for health, and has been linked to a decreased risk of heart disease, stroke, diabetes and obesity (21). Current guidelines recommend women consume at least 25 grams of fiber per day, and men consume at least 38 grams (22). To make sure you’re drinking enough water, drink when you feel thirsty, and spread your water intake throughout the day to stay hydrated. Summary: Vegans and vegetarians usually eat a lot of fiber. Drinking enough water can help prevent digestive problems associated with increased fiber intake, such as gas, bloating and constipation. Meat is a good source of many important vitamins and minerals, including iron. For example, a 3-ounce (85-gram) serving of ground beef supplies 14% of the iron you need for the entire day (14). Also, meat contains heme iron, a type of iron your body can absorb easily. Plant sources of iron contain non-heme iron, which your body can’t absorb as easily. Non-heme iron is present in many types of fruits, vegetables, cereals and beans (23). Because of this, vegetarians have a greater risk of developing iron-deficiency anemia, a condition in which there are not enough red blood cells in the body. Symptoms include fatigue, shortness of breath and dizziness (24). However, a well-planned vegetarian diet filled with iron-rich plant foods can meet your daily needs. If you’re a vegetarian or vegan, make sure to consume plenty of good sources of iron, including lentils, beans, fortified cereals, nuts, seeds, oats and leafy greens. Additionally, pairing iron-rich foods with foods high in vitamin C can enhance the absorption of non-heme iron (25). Vitamin C is found in most fruits and vegetables, so including a vegetable side dish, salad or piece of fruit with your meals can help increase iron absorption. Summary: Plant foods contain non-heme iron, which the body can’t absorb as well as the heme iron found in meat. Vegetarians should include iron-rich foods in the diet and pair them with vitamin C to increase absorption. Just because a food product is vegetarian or vegan doesn’t mean it’s good for you. There are plenty of processed foods available at the grocery store that are free of meat or animal products. However, they often contribute little to your diet. Instead of eating these, use your vegetarian diet as an opportunity to reduce your consumption of processed foods and increase your intake of nutrient-dense, whole foods, such as fruits, vegetables and whole grains. Increasing your intake of these foods will help you get the valuable vitamins, minerals and antioxidants you need to help prevent nutrient deficiencies. Eating whole foods rather than processed foods may give you other benefits too, such as an increased metabolism. One study measured the metabolism of 17 participants after they ate a meal made with either processed foods or whole foods. Both groups felt equally full after the meal, but the group that ate the whole foods burned nearly double the calories after their meal than the group that ate the processed foods (26). To start including more whole foods in your diet, swap out refined grains for whole grains, and limit the amount of processed and convenience foods you eat. Additionally, try adding more vegetables and fruits to your meals and snacks throughout the day. Summary: Vegetarian diets should be rich in whole foods, such as fruits, vegetables and whole grains. They’ll help you maximize nutrient intake and promote a balanced diet. Calcium is an important mineral your body needs to keep your bones and teeth strong, help your muscles work efficiently and support the function of your nervous system (27). A calcium deficiency can lead to osteoporosis, a condition that causes weak, porous bones and increases the risk of bone fractures (28). Though calcium is found in a variety of foods, the most well-known source of calcium is dairy products. Those who don’t consume dairy should monitor their calcium intake and include other high-calcium foods in their diet. Calcium-rich plant foods include kale, collard greens, broccoli, bok choy, almonds, figs and oranges. Fortified foods can also be a good source of calcium. You can get all the calcium you need by incorporating a few servings of these foods into your meals and snacks throughout the day. Summary: Those who don’t consume milk or dairy products should consume other calcium-rich foods to meet their calcium needs. Whether you’re cooking at home or dining out, eating vegetarian or vegan requires some extra planning. Meal plans are especially useful if you’re currently changing your diet to be vegetarian or vegan. They can help ease your transition and make it easier to maintain a balanced and nutritious diet. When you’re eating out or traveling, advanced meal planning becomes especially important. 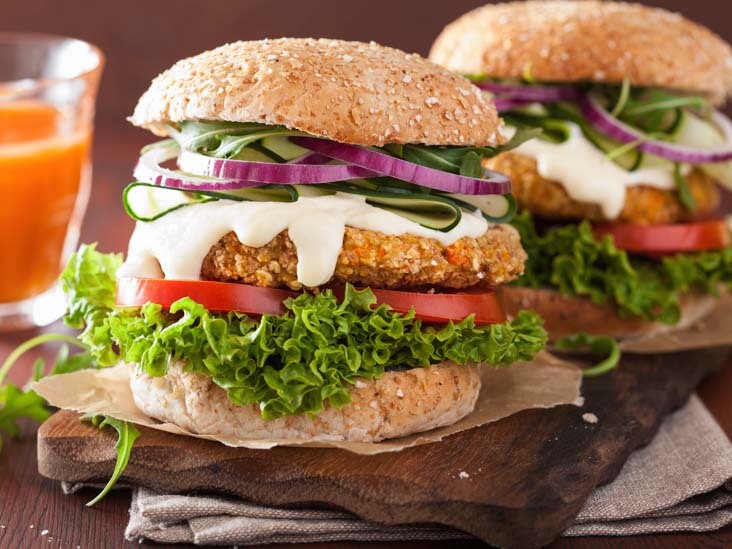 Some restaurants offer limited choices for vegetarians, so looking at the menu in advance can help you make informed decisions and select the most nutritious choices available. Additionally, make it a habit to find a few vegetarian recipes each week and cook them on your own. Summary: Planning meals ahead of time and knowing what your options are when dining out can ensure you maintain a diverse and balanced diet. Protein is an essential part of the diet. Your body uses it to help build tissue, create enzymes and produce hormones. Studies show that eating protein can also promote feelings of fullness, increase muscle mass and reduce cravings (29, 30, 31). Current recommendations suggest adults should eat at least 0.8 grams of protein per day for every 2.2 pounds (1 kg) of body weight (32). For example, an individual who is 154 lbs (70 kg) would need approximately 56 grams of protein per day. If you’re eating animal-based foods, you’ll probably find it easy to fulfill this requirement. A 3-ounce (85-gram) serving of salmon contains 19 grams of protein, while the same amount of roasted chicken provides 27 grams (33, 16). On the other hand, if you’re following a vegetarian diet, you may need to make a more conscious effort to eat high-protein foods that will help you meet your protein requirements. There are plenty of plant foods that contain an amount of protein comparable to the amount you’d find in meat. For example, 1 cup (198 grams) of cooked lentils contains 18 grams of protein (34). Beans, lentils, nuts, nut butters, tofu and tempeh can all up your daily protein intake. Try to incorporate at least one or two of these foods into each meal to make sure you’re getting enough protein. Summary: Vegetarians should be mindful of protein intake and include one or two servings of high-protein plant foods with each meal. Omega-3 fatty acids are an essential part of the diet. They have been shown to reduce blood triglycerides, alleviate inflammation and protect against dementia (35, 36, 37). Fatty fish and fish oil are the most common sources of omega-3 fatty acids. They contain docosahexaenoic acid (DHA) and eicosapentaenoic acid (EPA), the two forms of omega-3 fatty acids that have been shown to be the most beneficial. On the other hand, plant foods contain alpha-linolenic acid (ALA), a type of omega-3 fatty acid that your body must convert to DHA and EPA to use (38). Unfortunately, your body is only able to convert about 5% of ALA to EPA and less than 0.5% to DHA (39). To meet your omega-3 needs while following a vegetarian diet, eat a good amount of ALA-rich foods or consider taking a plant-based omega-3 supplement like algal oil. Foods highest in ALA omega-3 fatty acids include chia seeds, walnuts, hemp seed, flaxseeds, Brussels sprouts and perilla oil. Including a few servings of these foods in your diet each day can easily help you meet your omega-3 fatty acid needs. Summary: Plant foods contain ALA, a type of omega-3 fatty acid that your body can only use in small amounts. Vegetarians should consume a good amount of ALA-rich foods, or use a plant-based supplement. Many vegetarians fall into the trap of replacing meat with refined carbs. Unfortunately, pasta, bread, bagels, cakes and crackers often end up as main ingredients in a poorly planned vegetarian diet. During processing, refined grains are stripped of the beneficial fiber that is found in whole grains. Fiber helps ward off chronic disease, keeps you feeling full and slows the absorption of sugar to maintain steady blood sugar levels (21, 40). A high intake of refined carbs has been linked to a greater risk of diabetes, as well as an increase in belly fat (41, 42). To maximize the nutrients in your diet, switch out refined grains like white bread, pasta and white rice for whole grains such as quinoa, oats, brown rice and buckwheat. Additionally, make sure you’re pairing those whole grains with plenty of whole fruits, vegetables and legumes to keep your diet balanced and nutritious. Summary: Instead of replacing meat with a lot of refined carbs, vegetarians should consume whole grains as part of a healthy diet. A balanced vegan or vegetarian diet can be very healthy and nutritious. However, these diets can also lead to nutrient deficiencies and potential health problems if they aren’t well-planned. If you’re just getting started eating this way, check out this article. To achieve a healthy vegan or vegetarian diet, simply eat plenty of whole foods and make sure you’re regularly consuming a few key nutrients. Fake a Smile at Work, Drink Too Much Later?